Hi there! 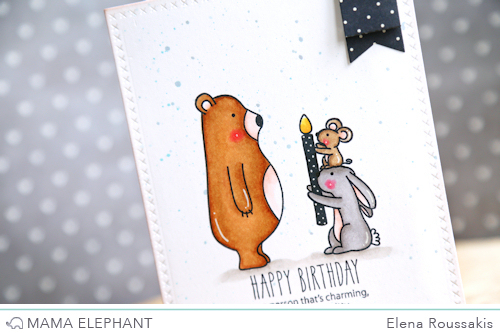 Elena here, with a card using the new Birthday Wishes set. I paired it with the critters from Woodland Gifts. The bear's blank expression says it all. What'd you say? haha. The bunny and the mouse are being a little cheeky, stacked to hand him the extra large candle. I stamped the solid candle with a black ink, and then added polka dots by way of a white gel pen to match the patterned paper flag. Once the critters were colored, I masked them and splattered blue ink like confetti onto the card front. 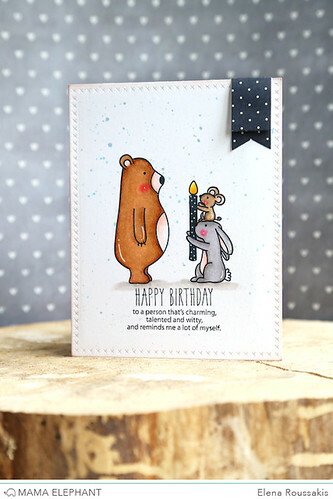 This is an adorable card!!! Love the sentiment too! Very cute! Love that stamp set! Oh my!! this is adorable!! Like it?!? I just LOve it!! I like what this says. It's really cute! What a great birthday card! That is just impoooossibly CUTE! Love it! This is too cute for words! I love how it takes 2 of them to hold onto the candle! Adorable card, Elena! Very cute! I love the sentiment! Oh! What an adorable and sweet scene! That sentiment cracks me up!